Ring, Ring - Nekaro & Co.
Today ends the first week of school here. My baybee, Neil, started middle school this year. I thought I was going to be all emotional when they left for school on Tuesday, but it never happened. I watched them get on the bus as usual and off they went! I spent all day actually getting stuff done around the house, in between diaper changes and feedings. At 3:30pm, the hubs made it home from work. Normally the kids and Chris get home around the same time, but they weren't home. We waited... waited... Finally around 4pm the bus rolled up. It turns out that their bus has a later schedule this year for the afternoon pick up at their schools. They came bounding through the yard, happy to be home. Both of them said their first days went well. Neil said, "I need the phone." The next afternoon, the same thing happened. His "girlfriend", H, calls from her cell phone. My kids don't have cell phones of their own. Mainly because we can't afford for them to have phones, but also because, in my opinion, there is no reason for my 10 year old daughter or my (nearly) 12 year old son to need them. I understand the need for some children to have cell phones (divorced parents, latch key kids, etc. ), but my kids have no need. I told him to ask H if she is on the same company that we are on. She is, so I tell him to call her from either mine or his father's phone to keep costs down for her parents. Big mistake.... uh, muh bad! Thursday morning, his friend, J, calls here at 6:23AM! Six o'clock in the freakin' morning y'all?!? I told him to get off the damn phone. Who the heck calls someone that dang early anyway?? Guess what happened yesterday afternoon? Big mistake... uh, muh bad! Back and forth, back and forth... until finally the hubs texted her back with, "Neil is going to bed now." How did this happen? How did we get here? I had no idea that the whole pre-teen mess would start so abruptly! So suddenly! I mean, we are only 4 days into the school year! 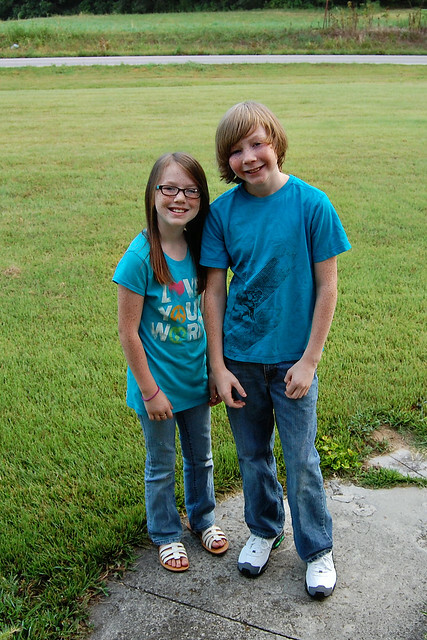 How am I going to survive next year when both of them are in middle school?! ?